The Blueberry Files: Allgash Tap Takeover at Eventide Oyster Co.
You all know I love Eventide Oyster Co. so when I heard that Chefs Taylor and Wiley are nominated for Food & Wine magazine's People's Best New Chefs of New England (go vote! ), I got a craving. They were celebrating last night with an Allagash tap takeover, featuring new Allagash releases and a special $3 oyster bun with a beer. I hurried down there early to grab a table and tried the Allagash B.A.T. or Beer Advocate Tequila. The B.A.T. is a Belgian Strong Pale Ale aged in tequila barrels, which gave it a smoky quality, but not as strong as the Curieux, which is aged in bourbon barrels. I loved it. 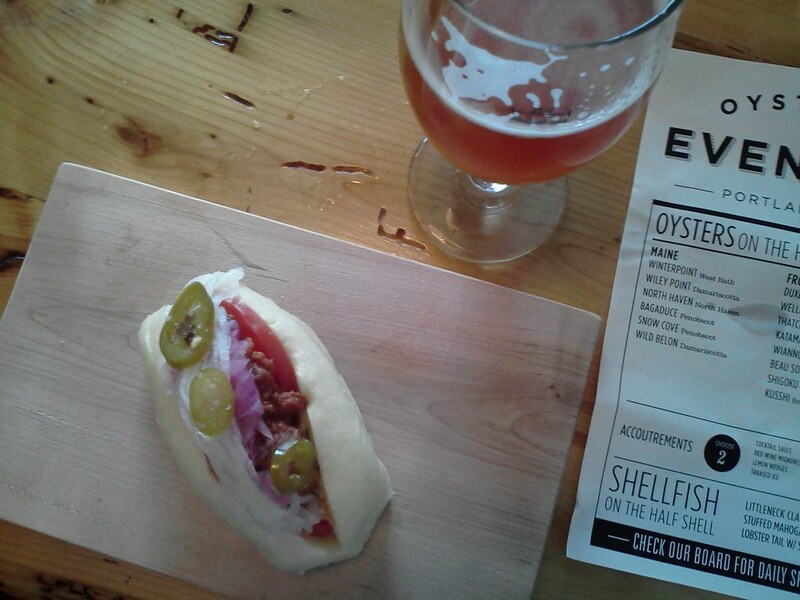 The oyster bun was great as usual, all steamed bun and crispy coating mixing with mayonnaise and pickled crunch. I then scheduled a date with S. of Edible Obsessions for dinner. If you haven't already, treat yourself to Eventide.